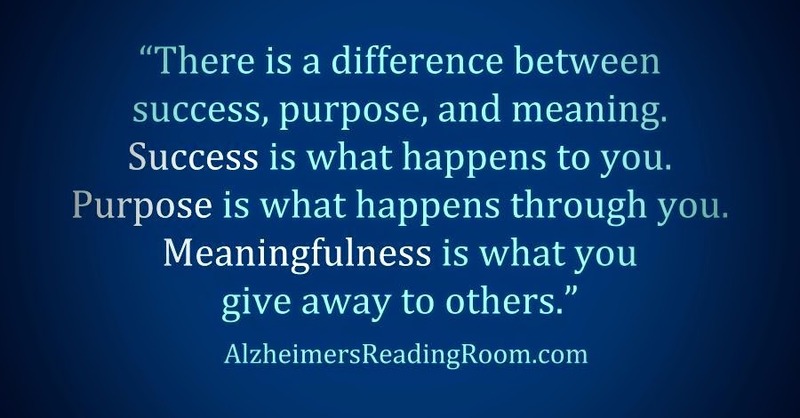 It is my belief that if Alzheimer's caregivers will open their mind, along with their heart, they can come to only one main conclusion - they are leading a meaningful and purposeful life. I believe that each person is searching for meaning and purpose in their life. Meaning and purpose! There are many ways to lead a meaningful and purposeful life, this article is about those who care - who care for a person living with Alzheimer's or a related dementia. I remember when people were surprised that I was an Alzheimer's caregiver. Many were surprised because I was a man (40 percent of caregiver are men). They were surprised because I was the youngest child. There were some who seemed surprised that my sister wasn't doing it. As if for some reason the act of caring is the job of a woman. There were also a few, they had never met me before, that said, "you're the one". In every case they were also a one. It is my belief that we are born a ONE. 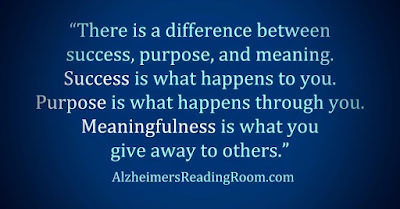 It is my belief that each Alzheimer's caregiver is leading a meaningful and purposeful life. We are I believe operating at a very high station in life. What could be more meaningful than caring for someone who is so fragile and so needy. They need us. They could never survive or operate without us. When we go out of their sight they call out our name. If we go away even for a little while they ask for us repeatedly. They want to know where we are and when we are getting back. They even get angry at us if we take even a little break. They love us so much they cannot stand to be without us. They love us more - this is my belief. People often said to me things like: I had no life, that I gave up my life for my mom. This mostly made me feel anger. No one can decide for me what my life is about. While caring for my mom I was living my life each and every day. I was living a life that was rich in spirit and rich in accomplishment. If not me who then? I'm a ONE and nobody can take that away from me. I have had a life of great success. Many wonderful and sometimes important accomplishments. But success does not necessarily equate to meaning and purposefulness. Success to me was like a game - a game I really enjoyed. Caregiving is about life -real life - the meaning of life. My greatest accomplishment in my life was caring for my mom, Dotty. Why wouldn't I do it? I believe your mom is the most important person in your life. This does not diminish the role my father played - he was the best. When the day after comes you can sit around and be sad and lonely. You can accuse yourself of not doing enough. You can dwell on the past and let it drag you down. You can be deeply sad. you have lived (or are living) a meaningful and purposeful life. A life rich in spirit and rich in love. We as caregivers lead purposeful and meaningful life. Can everyone make that claim? 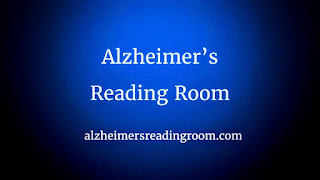 The mission of the Alzheimer's Reading Room is to Educate and Empower Alzheimer's caregivers, their families, and the entire Alzheimer's community.